A beautiful holiday should feature a worthy vacation spot. If you are visiting Banten, you should reach Serang Regency. 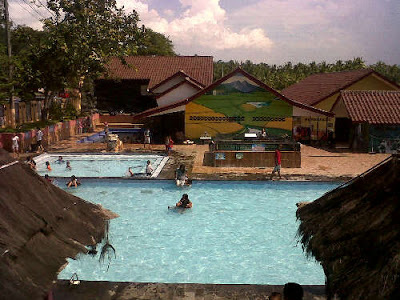 It is the home of Batu Kuwung Hot Spring. The location is in Padarincang District. To be exact, it is located in Batu Kuwung Village. It is also near to Karang Mountain. Apart from locals, many people from Jakarta and other cities also visit it. Here is the fact. This hot spring is considered the oldest one in Banten. It emits roughly 75 degrees Celsius. In terms of appearance, the hot spring features a man-made pond. In the middle part of the pond, you can find the source of water. It is covered by stones. In the back, you can see some structures. The atmosphere is similar to a resort. There are actually two ponds. First, it is for adults. It features deeper water, for sure. Another pond is for kids. It features shallow water, so your kids can play in it safely. Both of them share the same quality of water, which is clear and warm! The primary activity in the hot spring is indeed bathing. The water is considered hot. Thus, the management decided to mix it with fresh water. As the result, there are ponds with warm water. These are used by tourists for bathing and swimming. Apart from that, you can learn the history of this tourist spot. It was named after the shape of the stone, where the water comes out. In the past, some bad guys meditated on such stone to eradicate bad lucks and evil traits. As mentioned earlier, you can choose either a big or small pond. It depends on the size of your body. For kids, it is better to use the smaller one. Tourists are allowed to swim in those ponds. Still, you can also simply soaking in the water. According to locals, the water has a healing ability. It helps you deal with skin and bones issues. The water is warm, indeed. In the horizon, you can see majestic mountains and unspoiled scenery! As for precaution, you should never use soap while bathing in Batu Kuwung Hot Spring. Why is that? It is considered useless. Instead, you can simply bathe your body using the water simultaneously. Also, don’t spend too much time in the water. An hour is a limit. It is to avoid any side effects of hot water. Another tip is related to clothes. Make sure to carry some extras prior to visiting the hot spring. Don’t eat snacks in the water as it may ruin the environment! Your primary destination is Batu Kuwung Village. First, you should head to Serang Regency. If you come from Jakarta, the trip takes about 2-3 hours and the distance is 117 km. You can use Pantura Street and a Tangerang-Merak Freeway. If you want a comfortable trip, a car is a better choice. It is possible to ride a bus, too. However, it can be quite crowded during holidays!